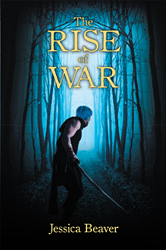 Recent release “The Rise of War” from Page Publishing author Jessica Beaver is an imaginative work of fiction, following the journeys of three radiant young characters. Jessica Beaver, a passionate writer and author, has completed her new book “The Rise of War”: a gripping and potent story of adventure, struggle, and newfound companionship. Published by New York City-based Page Publishing, Jessica Beaver’s poignant tale immerses the reader into a deep and intricate fantasy setting, known as the Kingdom of Shonilian. The intimately crafted characters find themselves in various episodes of strife, ultimately leading to unexpected but unshakable friendships. "There is one thing that all of us have in common–none of us know what the future will hold. Life is full of unfortunate twists of events that change the course of our lives . . . forever." says author Jessica Beaver. Starlighter is the sixteen-year-old heir to the throne of the mighty kingdom of Shonilian. In order to prove that he is a worthy suitor, he must face trials and test his capabilities. When his revenge-seeking uncle returns unexpectedly from exile, forcing him to run for his life, Starlighter’s strength is put to a much greater test; one far more difficult than he could have ever imagined. His uncle’s forces drive him into a dark forest where dangers untold lurk in every corner. Nobi and Rubis are twins, yet they are separated at birth when their mother, Helinka, leaves their father, Alo, and takes Nobi with her. Sixteen years after the separation, Nobi and her mother, who is an explorer, live on a lonely mountainside far away from civilization. Meanwhile, Rubis lives in poverty with his merchant father and everyday he grows restless, desiring a much more thrilling life. While both twins have gone through their dreary lives, not knowing about the other and always thinking of their dreams, they never suspect that on the same night their worlds would change forever. Soon Starlighter, Nobi, and Rubis are driven together by their own struggles and discover that they need each other in order to find their way out of the forest. Readers who wish to experience this potent work can purchase“The Rise of War” at bookstores everywhere, or online at the Apple iTunes store, Amazon, Google Play or Barnes and Noble.